This week the Milwaukee 2426 oscillating toolfound its way onto my workbench. It is one of the first cordlessoscillating tools ever made, and a best seller. Let's take a lookhow the 2426 measures up today. 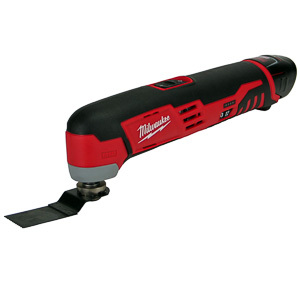 Cordless oscillating tools have been introduced in 2012/13. They excel at making flush and plunge cuts in all materials. Blade changes are a frequent operation when using a multi-tool. A keyless chuck allows the user to change blades with the use of a key or wrench. A universal adapter allows attachments from competing manufacturers to be mounted on the multi-tool. The cordless oscillating tool market is still in it's infancy. There are few models to choose from at this time. If you already have other battery operated power tools, purchasing a multi-tool that takes the same batteries is a good choice. The 12V models are significantly smaller than the 18V models making them more agile around the job site. If you only have a few cuts to make, the 12V tools provide enough performance. The 18V tools are a better choice, if you use your multi-tool for more than 10 minutes every hour. "A capable tool that cuts well. Great choice for anyone who makes a few, quick cuts during the workday. Excessive vibrations limit heavy-duty use."